Hello ... Hello ... my old friends ... It's great to see you once again! It is so very apt to be writing and compiling this review on the 69th birthday of Sir Paul McCartney! Hence; it was my great pleasure to be in attendance and witness the first ever live gig by Band On The Runn at the Goodrich Club in Wolverhampton last night [Friday 17th June] with Christian 'Jet' Evans. In a packed venue, this new Paul McCartney, Beatles and Wings tribute act delivered a phenomenal, unbroken set for over two hours that including some great interpretations of Macca influenced song writing and performances from the first Beatles album through his Wings career and solo material up to his time with The Firemen. Band On The Runn are: Craig Whale, Adam Willetts, Ian Hammond and Dave Cottle. 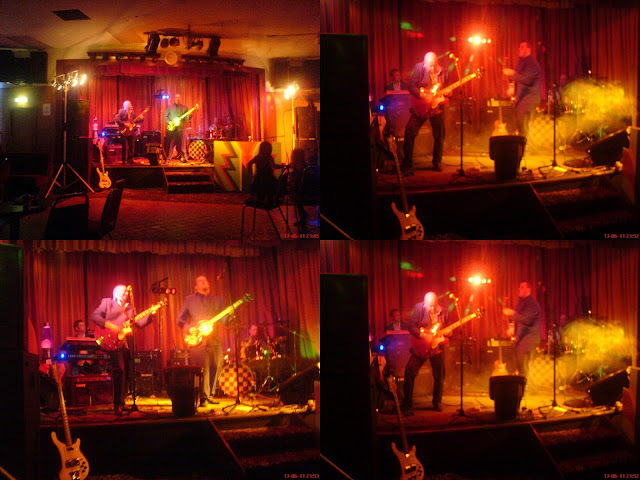 For a band playing for the first time in front of a sizeable audience; This group are polished, tight and professional performing tracks such as: "Jet"; "Flaming Pie"; "Hey Jude"; "Highway"; "Coming Up"; "Back In The USSR"; "Hey Jude"; "Let 'Em In"; "Live And Let Die"; "Let It Be"; and "Drive My Car" amongst many others. Yours Truly KJS has to say that my absolute fave last night was "The Long And Winding Road"! ELO Beatles Forever [ELOBF] recommends Band On The Runn to those enlightened folks who enjoy the music of ELO, Jeff Lynne, Roy Wood, The Move, The Idle Race, The Beatles, 'Brum Beat' and related artistes as well as to the many live music venues and promoters here in the Midlands of England and beyond!